Combining the top two of its smartphone brands, Droid and RAZR, Motorola has revealed its newest Android smartphone: The Droid RAZR. The Droid RAZR includes most features iPhone 4 owners were expecting to get in the famous iPhone 5. 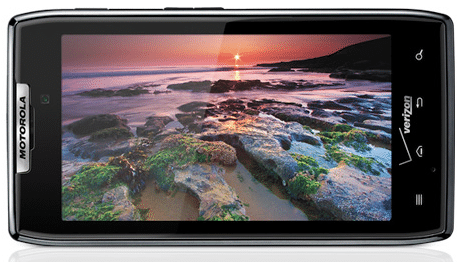 The Droid RAZR features a 4.3-inch Super AMOLED Advanced qHD touchscreen display with a scratch-resistant corning Gorilla Glass. If we remember back when the original RAZR was released, it was the thinnest phone back them. Now Motorola is aiming to do the same thing with the Droid RAZR making it just 7.1mm in thinness. According to Motorola Mobility CEO Sanjay Jha, the Droid RAZR will be the thinnest compared to every other smartphone available in the market. The Droid RAZR will not only be one of the thinnest smartphone in the market, this phone will also be one of the lightest phone with a chassis made out of Kevlar and steel. Motorola added its Splash Guard technology to this phone — even the electrical boards this phone has are protected with Motorola Splash Guard technology to prevent the phone in getting damaged if the phone gets dropped in your pool while you’re swimming. You hate laggy phones? Don’t worry! Motorola is making sure this doesn’t happen in the Droid RAZR with the dual-core 1.2 GHz processor and 1GB of RAM memory. All of these will be handled by Android 2.3.5 Gingerbread and a 1800 mAh battery to give you 12.5 hours talk time, 8.9 hours of video playback and power the LTE 4G antenna. This phone also comes with many software for different tasks. The RAZR will be docked by Motorola’s webtop. A new feature that will be included is Moto Cast – a personal cloud support. The device also includes some Enterprise features such as Citix Receiver, GoToMeeting, Videoconference with HD webcam. The RAZR will have business ready apps Corporate email access, Corporate calendar and addresses, Microsoft Office documents support. Verizon will start taking pre-orders for this device on October 27th. It will cost $299 on Verizon on a two-year contract. The Droid RAZR will be available on November globally, where it will be known as Motorola RAZR only.